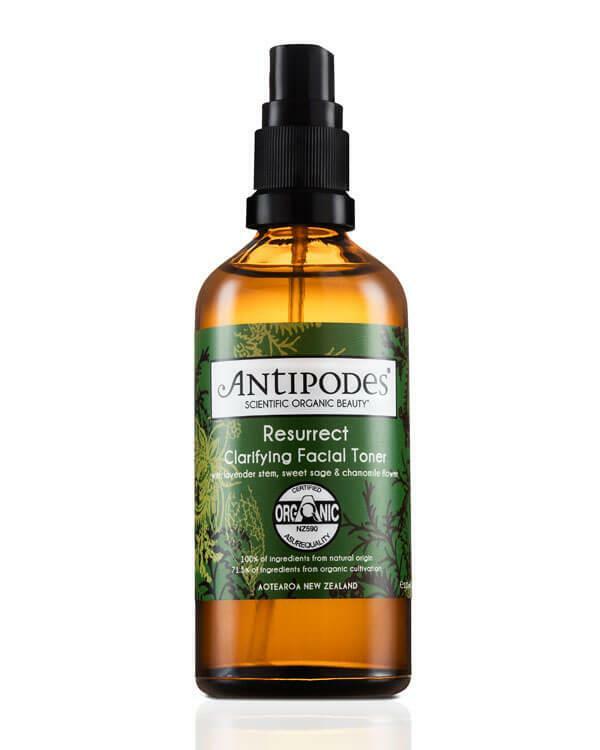 The Resurrect Clarifying Facial Toner from Antipodes! This active, clarifying toner helps reduce the appearance of visual and open pores while providing balance and resurrectoin to your skin's surface. Beautifully refreshing, it harnesses the positive energy of sweet sage. Suited to normal and oily skin conditions. Discover scientifically validated ingredients and formulations in the Resurrect Clarifying Facial Toner that enhance your skin to function naturally, feel better and look its beautiful best. The Resurrect Clarifying Facial Toner is certified organic by BioGro: 100% of the ingredients come from natural origin and 71.5% of the ingredients come from organic cultivation. This toner is also certified vegetarian by the UK Vegetarian Society, a globally respected organisation for the assessment of vegetarian status. The Resurrect Clarifying Facial Toner comes in a recyclable glass bottle and the packaging is made from 100% biodegradable cardboard from sustainable forests. Spray Resurrect Clarifying Facial Toner from Antipodes generously across your face, neck and décolletage several times daily for an immediate moisture boost and relief from environmental aggressors. Once you have cleansed, toning achieves the perfect skin preparation before applying your favourite Antipodes serum and moisturiser. Suited to normal and oily skin conditions. Chamomile: This oil has a calming effect on skin and accelerates the healing process. Sweet sage: The positive energy of this herb helps reduce the appearance of visual and open pores. Lavender water: The infused water has calming, soothing properties and can be used to treat blemished or irritated skin. A few years ago, New Zealand-based Elizabeth Barbalich decided to do things differently and chose to follow the natural and healthy path in life. “I couldn’t find any natural skincare that performed as well, or felt as good on my skin, as the conventional brands I was using,” she says. “I saw a need in the market for a cool avant-garde, niche brand that elevated natural skincare to the next level.” After years of research and experimentation, she launched her high-tech certified organic beauty brand, Antipodes®. Antipodes® combines cutting-edge science with the highest quality ingredients from New Zealand’s nature and raw super-fruit extracts. Discover Antipodes®, an incredibly innovative, next-level organic skincare brand.